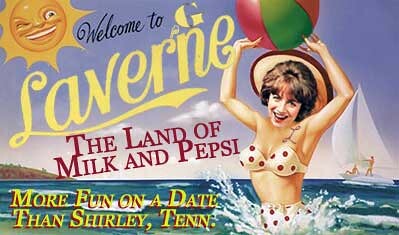 The Squirrel Queen was solicited, but not commissioned, by Kathy T to create a new logo for the city of LaVergne. After much goading, poking and prodding by her, the Queen finally conceded and came up with this little postcard blast from the past. Now don’t let the retro feel fool you. The lovely metropolis is a forward thinking outpost with passionate citizens like Kathy T and the gang who, when not rescuing drowning residents from the cool, tempting waters of LaVergne Lake, are diligent in keeping their neighbors informed.